“Mozilla Firefox Opinion Poll” Messages is what we call recently noticed suspicious questionnaires asking the user to fill his information for freebies. Despite the threat’s title, you should know it can be noticed by those who surf the Internet with Internet Explorer and Google Chrome just the same. The only difference is such surveys should ask to answer questions about Google Chrome and Internet Explorer instead of Mozilla Firefox. Our specialists came across these questionnaires themselves, and after some research, it became clear they are fake. It means if you fill these false surveys, not only you will not get the promised reward, but also give away your private information to scammers. As a consequence, users who come across “Mozilla Firefox Opinion Poll” Messages are advised to get rid of them immediately. The instructions seen at the end of the article will explain how to eliminate the threat. However, if you would like to find out how it appeared in your browser and other vital details, you should read the text as well. If you ever receive an alert suggesting to fill some information for prizes and other tempting free content you should first find out if it is not a false survey. For example, you could go to the company’s asking to fill the questionnaire official site and look for information about it. Another thing that may indicate the alert could be a fake one is the URL address of the website it is on. 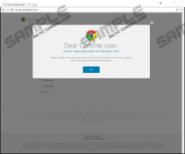 For instance, the fake surveys in question should say the company asking to fill them is Mozilla, Google, or Microsoft, but the URL address of the website containing the questionnaire (opinionpoll2017.com) does not appear to be anyhow related to these companies. Thus, despite the provided logos, you should notice “Mozilla Firefox Opinion Poll” Messages come from a suspicious source. Next, we would like to discuss how the user might get redirected to the mentioned website (opinionpoll2017.com) where he could see the fake alert. It appears to be the redirection to “Mozilla Firefox Opinion Poll” Messages might be done by adware or similar untrustworthy programs. If you wonder how such software could appear on your computer, we would say usually users place it unknowingly. The most usual scenario is when users visit various file-sharing web pages and download bundled setup files from them. Downloading such content is careless enough, but launching the installer and skipping advanced or custom installation settings is even worse. This way the user might lose his chance to deselect bundled applications, which knowing the setup file is received from an unreliable website, could be possibly harmful. Probably, most users skip advanced installation settings to make the installation go faster, but in the future keep it in mind that those couple of invested minutes could help you keep the system secure and avoid various threats. Of course, for complete protection, it would be advisable to get a reliable antimalware tool as well. Such a tool could also help you find the threat that might be responsible for redirecting you to sites containing “Mozilla Firefox Opinion Poll” Messages. Talking about questionnaires, we should say they might seem to be somewhat convincing and try to tempt users with various freebies in exchange for particular personal data, e.g., your name, phone number, email address, and so on. Clearly, instead of submitting any personal information on “Mozilla Firefox Opinion Poll” Messages, we would advise users to eliminate these suspicious questionnaires. Our researchers say the first thing you should do is close the window showing the fake alert and then reset the browser. Once this task is done, it is highly advisable to check the system and erase all possible threats you could have downloaded unknowingly. 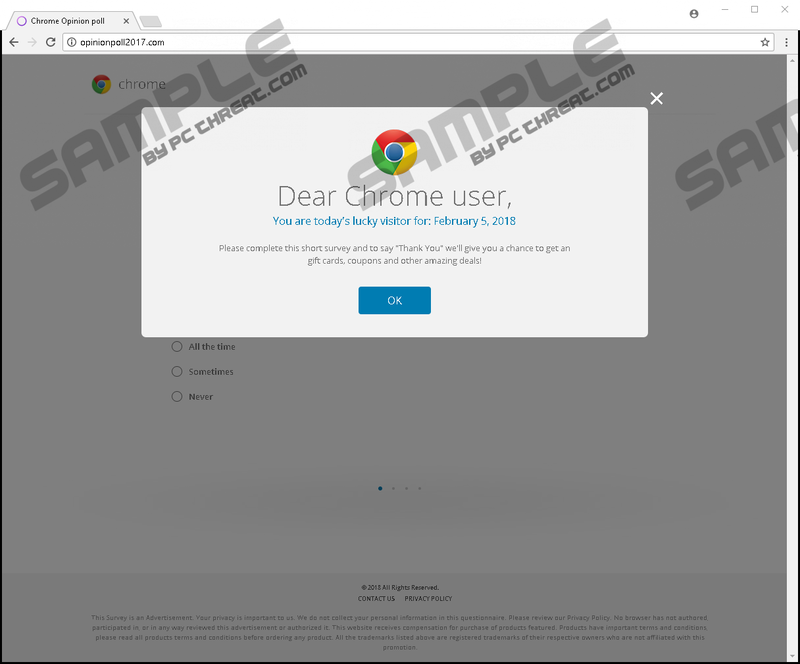 If it seems a bit too complicated or if you cannot find the threat responsible for these false surveys, you should install a reliable antimalware tool, do a full system scan and then press the given removal button. Go to Processes and look for your browser’s process. Select it and click End Task. Tap Alt+X and open Internet Options. Open the Advanced tab and click Reset. Select Reset again and tap Close. Click Refresh Firefox again and press Finish. Tap Alt+F and go to Settings. Scroll below and choose Advanced. Slide down again and press Reset. Quick & tested solution for "Mozilla Firefox Opinion Poll" Messages removal.